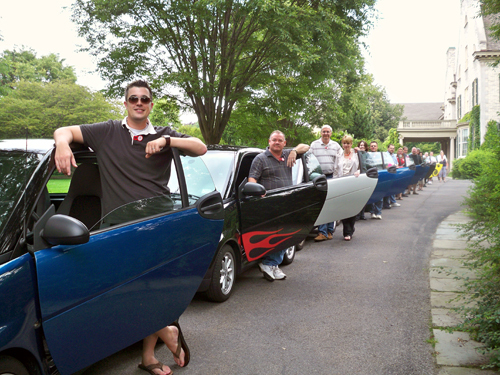 Today we went to a Smart Car Rally at the George Eastman House that Aaron helped organize. There were about 15 Smart Cars there with their proud owners. We had a great ride until a torrential downpour at Abbotts in Charlotte almost washed us away. The day ended with a talk and book signing from NYTimes food writer Mark Bittman. Aaron was interviewed by Channel 8/Fox News - but they got his name wrong! haha wow they weren't even close! how awesome ! pictures of all the owners outside their cars... so cool! Wow, that is awesome! I love the guy's car behind Aaron has flames on it! what a shame they didn't get the name right! and they're fox journalists!